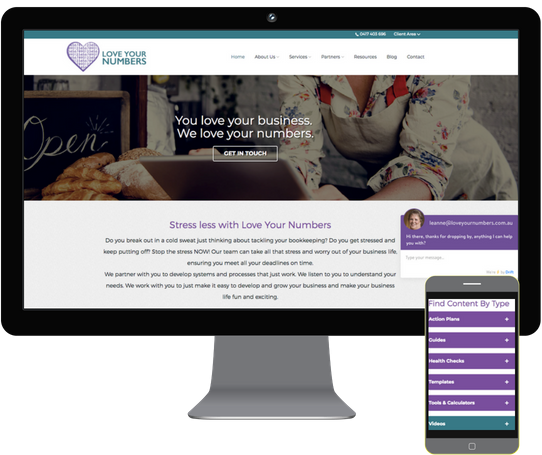 Leanne Berry’s journey to a new Love Your Numbers website starts some years ago. Back when social media was in its infancy, Leanne took three months out of her past business to learn about social media, websites, WordPress, hosting and website management. “For as many years as I can remember I have built my own websites. My philosophy is if I advise clients on something then I need to know how to do it myself.” Leanne said. Since Leanne built all her past websites, she knew a lot about how they should be run and maintained. “But it became such a burden, the site was starting to look old and I hadn’t been able to keep up with all the changes.” Leanne told us. So when MYOB started recommending Bizink a few years ago, Leanne took a closer look. “I knew I needed to get my blog revitalised because it had become too hard and I was too busy to keep it going. I signed up for Bizink’s Business Booster Blogs which have so many great blogs to choose from.” Leanne said. Love Your Numbers are also using Bizink’s Marketing Services to boost their marketing, and have seen some great results already. “The 90 day rolling marketing plan Bizink created with me is great. It’s about picking a theme and running with it for the three months, so we get three months of consistent value.” Leanne explained. “Our social media engagement is just going through the roof, and it’s all organic! Post engagements for the week of 27th Sept – 3rd Oct were up 3700%.” she added. “Everything is automated which is fantastic. Bizink writes four blogs a month that turn into a newsletter, it’s just so great. It’s hands off but it’s regular, consistent and meets the values and the themes I want to promote. Now I’ve got email marketing campaigns going out, a regular newsletter that I hadn’t had before and a weekly blog post that goes out far and wide across Australia and New Zealand.” Leanne told us. Check out the Love Your Numbers website for yourself.